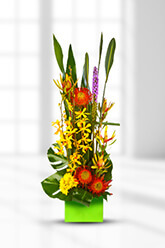 This spectacular arrangement will have anyone rise to attention with its expressive red Pin Cushion Protea, delicate yellow Aranthera Orchids, endearing and intricate Leucadendron Stems and splash of colour with yellow Chrysanthemum blooms and mauve Liatris Stem, beautifully framed with Tropical Greenery in a ceramic vase.VASE INCLUDED. We recommend including a special bottle of Sparkling Wine to this already Spectacular gift to make it extra special. Still waiting to see if flowers have been delivered. Were to be sent yesterday. More then helpful, excellent service. Love the reminder via email of the upcoming special occasion. Lovely girl helped me, excellent! Positive overall. From the ordering to the processing of the order. From the feedback received from recipient, they were over joyed by the flower arrangement and the other goodies. Thank you so much, I had a SMS from the girl who received them, she was blown away with the beautiful arrangement, thank you again. I don't send flowers very often but when I do, I choose zFlowers.com because I know I can rely on the quality. Keep up the good work. The quality of flowers and arrangement met and exceeded expectations. My mother was delighted and that's what ultimately counts.